Be the first to share your favorite memory, photo or story of Freida. This memorial page is dedicated for family, friends and future generations to celebrate the life of their loved one. 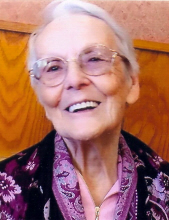 Freida G. Hollabaugh, 91, was born in Centralia, Oklahoma to Jesse and Nettie Mildred (Howe) Foreman on February 4, 1928. She attended school at Wimer Rural School and finished high school at Centralia. On December 8, 1945, she married John B Gordon Hollabaugh, son of John T and Hattie M (Swargety) Hollabaugh at Oswego, Kansas. In 1947, they moved to Sioux Falls, South Dakota, where her husband found work at Morrills Meat Packing plant. After 10 years, they moved to Lennox, South Dakota, where Freida worked at the Good Samaritan Home and became a member of Calvary Baptist Church. In 1972, she attended Vo-Tech school and became a Licensed Practical Nurse. She was also an EMT with the Lennox Ambulance Service. In 1976, they moved back to Oklahoma, after her husband retired from Morrills. She worked for Eastern State Hospital of Oklahoma and for Home of Hope. She was a member of OLPN. She attended Calvary Baptist Church of Vinita. After her husband’s death in 2002, she decided to move closer to her daughter, Christine and husband Robert Bond, and their son Jeremy R. Bond and wife Stacey of Independence, MO, who survives her. She has four grandchildren Alannah, John, Brayden, and Isabella, and three step grandchildren Seth, Alexandra, and Tanner. She has one surviving brother, Marvin George Boone of Nowata, OK. Also surviving are four sisters in law Donna Boone of Texas, Darlene Boone of Delaware, OK, Alma Spunaugle of Vinita, OK, and Evelyn Lofton of Coweta, OK, one stepsister Wilma Miller of Miami, OK, as well as numerous nieces, nephews, cousins, relatives, and friends. She was preceded in death by her father Jesse and her stepmother Trilby, her mother Nettie Mildred and her stepfather Stanley Boone, one sister and brother in law, Doris J. and Bill Gaut, and three brothers James, Claude, and Wayne Boone. To send flowers or a remembrance gift to the family of Freida G. Hollabaugh, please visit our Tribute Store. "Email Address" would like to share the life celebration of Freida G. Hollabaugh. Click on the "link" to go to share a favorite memory or leave a condolence message for the family.